Disney has officially announced plans for its streaming service, Disney+, revealing at its 2019 Investor Day on Thursday, April 11 that the Disney+ SVOD service will launch on Nov. 12 at $6.99 per month/$69.99 per year. The company said that by the end of its first year, Disney+ will host more than 7,500 episodes of television and 500 movies, according to The Wrap. However, all of that content won't be available right away, with numerous films and television series slated to roll out during "Year One" and "Year Two," according to Disney. At launch, there will still be numerous Disney projects available, including new shows exclusive to the platform and several highly-anticipated Disney films set for release in 2019. Scroll through to see what will be on offer when the service launches in November. This very meta 10-episode series follows a group of students at the real-life East High as they prepare for their school's performance of High School Musical: The Musical. According to the description, "show-mances blossom; friendships are tested, while new ones are made; rivalries flare; songs are sung; and lives are changed forever as these young people discover the transformative power that only high school theater can provide." 'The Mandalorian' is the first-ever live-action Star Wars series and is written and executive-produced by Emmy-nominated producer and actor Jon Favreau. The show is set after the fall of the Empire and before the rise of the First Order and follows a gunfighter in the outer reaches of the galaxy "far from the authority of the New Republic." This animated series is comprised of 10 shorts featuring the character Forky from Toy Story 4 and will follow Forky, who is made from trash, as he asks questions including "What is love? What is time?" and "What is cheese?" "SparkShorts" is Pixar Animation Studios' short film series designed to "discover new storytellers and explore new storytelling techniques." Kristen Bell will host this unscripted series, which brings together former cast members of a high school musical and tasks them with re-creating their original performance. Musicals featured include classics like The Sound of Music, Beauty and the Beast, Annie and more. The decades-long history of Walt Disney Imagineering will get a closer look in this documentary series, which was created by Leslie Iwerks and will feature exclusive interviews and never-before-seen footage from Disney’s parks around the world. This series showcases young heroes making a difference in their own communities, with the show featuring participants who "have dedicated their lives to selfless acts of bravery and kindness." The actor will helm the new show, each episode of which will center on a universally beloved item, like ice cream, and examine it to give viewers a perspective they never could have imagined. A retelling of the classic tale, which Disney adapted into an animated feature in 1955 film, this new version will star Tessa Thompson and Justin Theroux as the voices of Lady and the Tramp, respectively, the two dogs from different tracks who come together on an adventure and ultimately fall for each other. Disney+ will soon be the exclusive home for Disney content after it makes its way out of the theaters, with several 2019 releases, including Captain Marvel, Avengers: Endgame and Toy Story 4 set to hit the streaming platform after its launch. 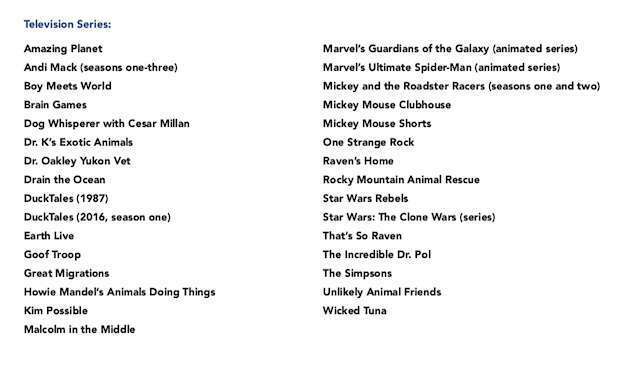 A sampling of films initially available from Disney's extensive catalogue includes classics like Bambi, Finding Nemo, Frozen, High School Musical, Moana, Sleeping Beauty, The Little Mermaid, The Princess Diaries and Toy Story.